The Theory of Focusing-Oriented Psychotherapy with Eugene T. Gendlin, Ph.D.
Home > The Theory of Focusing-Oriented Psychotherapy with Eugene T. Gendlin, Ph.D.
2 DVDs: 90 and 60 minutes. 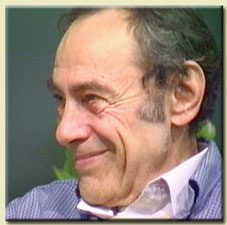 In this video, Eugene Gendlin, widely known for his Philosophy of the Implicit, the practice of Focusing, and focusing oriented therapy speaks about his essential ideas on how psychotherapy works. In it, he brings us step by step into his experiential thinking about the nature of being human and the wider implicit bodily living that can be accessed and unfolded. Theory is in between the details of clinical practice and the big wide umbrella of philosophy. It's the theory of Focusing that informs the clinical work of psychotherapists. In this video Dr. Gendlin makes three key theoretical points and discusses how they effect practice. The first is 'Interaction is First' and that a human being is interaction. 'It is the job of a psychotherapist be be the kind of interaction that helps make someone better'. The same content is a different living process with different people because it is a different interaction. When two people interact there is only one interaction. The second point is 'Experience is a carrying forward'. Carrying forward is a life process that happens in small steps and how we can facilitate those in therapy. And the third point is 'Implicit Intricacy' - that what wants to be carried forward is a living intricacy that wants to be carried forward and is already in interaction and it is unique in each person. Questions and answers about the demonstration.